On July 4th, we celebrate one of the most solemn days in American history, the signing of the Declaration of Independence. It was a transforming moment in the history of North America, which changed the British colonies into a self-determining nation. It is easy today, 239 years later, amidst the celebratory parties, barbecues, and fireworks displays, to forget that American independence was not inevitable and did not happen overnight. It was a hard-won victory that required a struggle of more than 30 years and great personal sacrifice from many men and women. And on July 4, 1776, that victory still hung in the balance. The War of Independence marks a second stage, although it began 15 months before the signing of the Declaration, at the Battle of Lexington on April 19, 1775, and ended in 1782 with the signing of the Treaty of Peace in Paris. The third and final stage reached its conclusion when Congress ratified the Constitution in 1789, bringing into being a new country and a new kind of government. But the great work of the American struggle for independence was not winning the conflict of arms. The birth of liberty was a contest of principle. At each stage, the struggle for independence was met by individuals, providentially prepared with minds and spirits trained to the issues of the times. 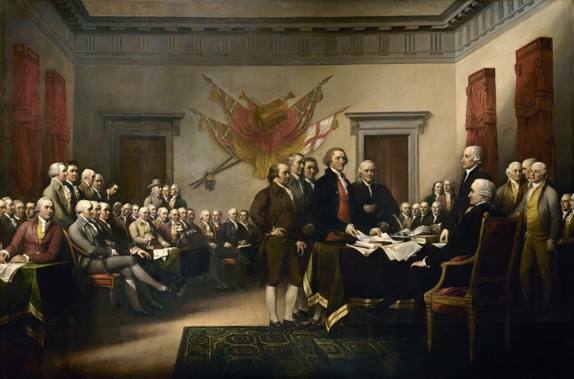 The Declaration of Independence was the standard heroically waved in this war of ideas because it annulled the idea that men were subjects to any tyrannical powers and affirmed the natural right to be self-governed. The tie to British rule was dissolved by one common act, the signing of that document. It made Americans into members of a distinct community in relation to each other, bound by the laws of nature and the Union. It was the opening to a new era in the science of government and in the history of mankind.